Entering Zion National Park from the east entrance immediately reveals a colorful display of orange, brown and white slickrock that includes one of the parks landmarks, Checkerboard Mesa. The majestic criss-crossed mountain appears as a massive hill towering 900 feet above the Zion-Mt. Carmel Highway and resembles a giant, extended chess or checkerboard. The vertical and horizontal fissures are more evident on the north side of the mesa, where most of the photographs of the mountain are taken. The left to right deep scratches are due to a north to south wind direction while the vertical cracks are a result of weathering, a cycle of freezing and thawing. Change still continues in the park, so much in fact that the massive monoliths will eventually break down and once again become great dunes of sand. Immediately west of Checkerboard Mesa is Crazy Quilt Mesa, another wonderful example of cross-bedding. Checkerboard Mesa was once known as Rock Candy Mountain, but in 1938 the superintendent of the park gave it the name we use today. Our trail report for this issue will take hikers on a fascinating hike that few have done. 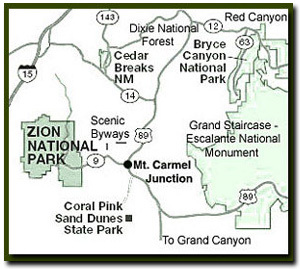 You will venture up the side of Checkerboard Mesa to the northern tip where you can look down upon the magnificent smooth stone hills , desert tanks and odd shaped outcroppings of twisted and manipulated sandstone seen in various shapes and sizes on the east side of Zion. Equipment: Sturdy hiking shoes with sticky rubber soles should always be worn when hiking on slickrock to ensure safer footing. Bring emergency equipment, plenty of water and energy snacks. Difficulty: This is a strenuous uphill route with a lot of bushwhacking, but the relatively short distance makes it a hike that can be done in a fairly short amount of time. Navigation skills are required. Sun Exposure: You will be in full sun most of the hike. Parking - Drive to the east entrance of the park where you will find the Checkerboard Mesa pullout and view point, just east of the toll booth. Walk west along Highway 9 until you are at the base of Checkerboard Mesa. The Wash - Follow the drainage on the east side of the mesa that runs along the slickrock, bypassing several potholes. Before too long the path becomes a sandy wash, winding southerly and ascending to the saddle that separates the more popular area north of Highway 9 from the less visited plateaus above Parunuweap. Stay in the wash as much as possible, passing the social trails that split off to the left, heading into the shrubbery on the hillside above. You will find the travel easier if you stay against the mountain and your hike will result in less erosion to the hillsides on either side of the drainage. There will be a few dry-falls along the route that can usually be avoided by going left, up and then around. The ascent will increase as the top of the saddle becomes more obvious. Watch for a visible trail that emerges and ascends through the trees. This "trail" will take you out of the drainage where you need to then locate the path which branches to the right before it reaches the actual saddle highpoint. The path demands that you scramble up a short 8-foot cliff band. Soon you will come to the forested ledge just below, and east of the Checkerboard Mesa tabletop. Now it is necessary to switch direction and travel north, back toward Highway 9, hiking on top of the ledge. Stay to the right, and just above the developing cliff so that you avoid even denser foliage up high. The use of game trails will make travel easier.This way is simpler than trying to ascend to the base of the caprock that comprises the Checkerboard Mesa table-top. Continue north for several hundred yards to the promontory just north and below the actual tabletop. Soon the terrain will level out and spectacular views appear. There is a good flat area to sit and have lunch. After lunch walk around and marvel at the expansive views of slickrock country. The main route to Checkerboard Arch is also part of one entrance to the magnificent Parunuweap Canyon route that leads through Fat Man's Misery and to the East Fork of the Virgin River.